When a New Yorker takes the plunge and settles into the magic city, the similarities become so uncanny that you mentally begin to depict the Miami neighborhood’s as their NYC counterparts. Here’s a snippet of how the two sister cities stack up. Ocean drive, much like Times Square, is one of the most photographed areas of the city. Tourists walk up and down the restaurant lined street, taking pictures of historic art deco hotels lit with florescent signage. Muscle clad locals work out at the “muscle beach”, beach volley ball games attract crowds of onlookers, and roller bladers/bike riders cruise up and down the wave-shaped sidewalks, to the backdrop of neon lights against deco architecture. The bright lights, sidewalk entertainment, and never-ending people watching provide the quintessential tourist experience (including $28 drinks with souvenir cups). People who haven’t been to Miami think all of Miami is like Ocean Drive, just as people who haven’t been to NY think that Times Square is the entire city, when in realty both tend to be overlooked by locals. However, its what draws visitors year after year. The Flamingo/Lumus area is considered the historic district, and houses many locals who appreciate the charm of deco buildings and walkability to shops, restaurants and other amenities. Much like the east and west village, locals are concerned about the preservation of the historical integrity of the neighborhood. Tree lined streets and 1940’s/ 1950’s multi and single family homes (some renovated and some original) are the heart of south beach (in both location and character) as waterfront high-rises line the exterior of the island. Until recent years, much like Tribeca, the now prestigious South of Fifth was little more than a ghost town. It wasn’t until 1992 when a German developer, Thomas Kramer, created the vision to transform South of Fifth into Battery Park. Now, some 15 years later, chic highrises, such as the Continuum, Murano Grand, Apogee, Yacht Club at Portofino, and the Icon, envelope the Southern most point of Miami Beach. Upscale restaurants such as Joes Stone Crab, Smith and Wollenskys, Prime 112 and Prime Italian, are within walking distance to the full service luxury condominiums, and deco low-rises alike. As Tribeca went from abandoned warehouses to hottest residential neighborhood overnight, so did South Point. Families, visitors and vacationers enjoy the local, quietness yet upscale feel of the area, which can be reflected in South of Fifth’s average price per SqFt. Like the Upper West Side of NYC, West Avenue is a convenient, local friendly neighborhood spanning the western side of South Beach, from 5th Street to 17th Street. Also like the UWS, Miami’s West Ave has the conveniences of walk-ability, a Whole Foods, Salons, Shops, sidewalk restaurants including Olivers and Soho Bay, Starbucks and Cvi.Che 105. Many families, working professionals, and singles enjoy the full service condominium living that buildings such as the Mirador and Flamingo have to offer. Tucked away from the hustle and bustle of South Beach, yet with all of the amenities, West Ave is a metropolitan option for those looking for urban, high-rise living, with more affordable prices than South of Fifth. Located just across the water from Miami Beach (and river of Brickell) sits Edgewater, a newly developed family friendly neighborhood, with luxury high-rises surrounding a pedestrian (and dog) friendly, bayfront park. The rates are slighly less than what one would pay for waterfront in Miami Beach or Brickell, yet the equidistant location provides are quieter living experience than being in the heart of action. Just as Long Island City and Hoboben are (relatively) affordable alternatives to city living, young professionals and growing families choose buildings such as Quantum, 1800 Club, Cite, Opera Tower, and 21 Biscayne. New Developements are also expanding the skyline, including Paraiso Bay, Elysee and Biscayne Beach. Restaurants, waterfront soccer fields, shopping and lounges, within reasonable commuting times to Downtown and the beach, are comparable to the LIC/Hoboken appeal. Miami’s Millionaires Row, which just like Uptown’s Park Ave, should really be considered Billionaires Row. This strip of Miami Beach is a residential neighborhood scattered with gorgeous, multi-million dollar homes and ocean front condos. Since the years Frank Sinatra claimed Miami as his go-to getaway, sophisticated NYC natives have flocked to the 40’s and 50’s in Miami Beach for sun-filled R&R. Much of the neighborhoods appeal is due to the proximity to the Fountainbleau, elegant and timeless full service buildings, and of course large concentration of other New Yorkers, either on seasonal visits or permanent relocations. The upscale, timeless units in buildings such as the Seacoast Building, the Green and Blue Diamond and Carriage House, not only share the refinement of the residential condos on Park Avenue, they also share many of the same owners. Confusingly enough, Miami’s downtown feels like the Central American version of Manhattans Midtown. Miami’s Seybold Building (36 NE 1st St, Miami, FL 33132) is comparable to NYC’s 47th Street, or the diamond district. It is comprised of 280 in house jewelers, who specialize in everything from custom pieces to repairs. Downtown Miami is also riddled with NY Style pizzerias, fabric shops much like those found in NYC’s garment district, luggage and camera stores similar to Herald Square, and of course a Macys. It also houses the American Airlines Arena (Miami’s Madison Square Garden, and numerous financial buildings. Miami’s downtown is a smaller scale NYC Midtown with Latin flare. What do Louis Vuitton, Celine, Versace and Christian Louboutin all have in common? Aside for their impeccably crafted European pieces, their boutiques line the streets of both Miami’s Design District and Soho. One can spend a Sunday morning brunching in ever popular eateries (NYC’s Balthazar vs. Miami’s Michael’s Genuine) and then stroll through some of the worlds best fashion stores. Aside from weather and classical vs. modern architecture, the two neighborhoods are virtually one in the same (Miami of course on the smaller scale). Brickell is Miami’s financial district, where a large concentration of Latin American banks as well as American banks position their headquarters for dealings with South and Central America. Until recent years, the area consisted of lunch spots and offices, and has recently become an epicenter of Miami urban living. Housing prices in Brickell have climbed higher than other highly sought after residential neighborhoods. Much of this is due to an improved economy and people working downtown enjoy the convenience of walking to work. Gyms and Yoga studios have begun to appear, and Mary Brickell Village provides late night restaurants and bars for young professionals looking to let loose from a stressful work week. 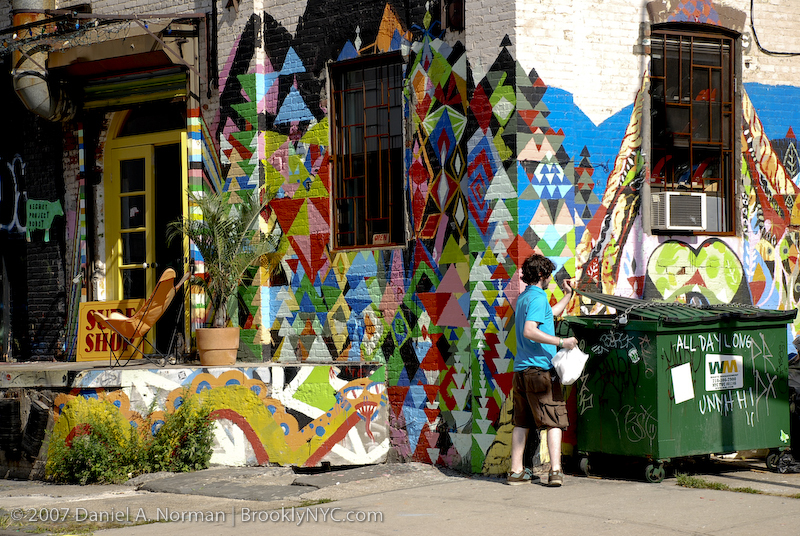 Both Williamsburg and Wynwood are flourishing communities for artists and bohemian types. 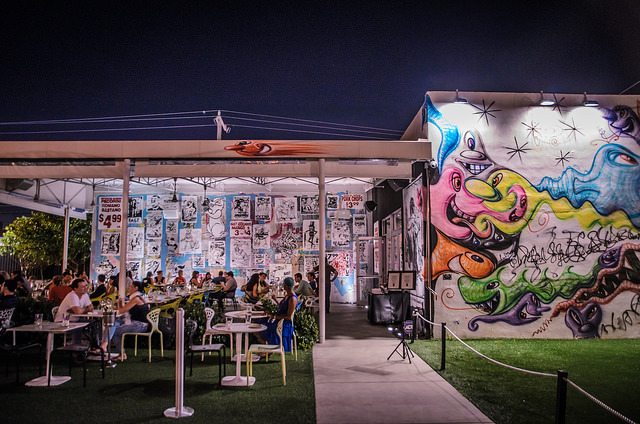 Wynwood has no shortage of art galleries and studios, such as the Wynwood Walls, Robert Fontaine Gallery, Art Fusion Galleries, and the Art Nouveau Gallery, to name just a few. Every second Saturday, galleries open their doors to the public and the streets fill with art enthusiasts who hop from gallery to gallery, while stopping at food truck stations and drinks at the Wood Tavern. While Williamsburg has certainly expanded in regards to real estate, with luxury highrises going up along the East River, Wynwood is experiencing a microcosm of high end living new constructions, such as 250 Wynwood. Coffee houses and micro-brew outposts line the streets of both neighborhoods, providing a more creative lifestyle for those looking for an alternative to the mainstream. Miami’s Bal Harbor offers the premier luxury shopping experience in South Florida. As Fifth Avenue in NYC is coined as “the most expensive street in the World”, perhaps on a smaller scale, The St. Regis, Ritz Carlton and Bal Harbor Shops make this stretch of Miami one of the most luxurious and prestigious in South Florida. This is just a limited taste of the apples to oranges comparison of NYC to Miami. To the South, North and West, cultural enclaves are limitless in both cities. Miami’s international influences and urban conscious patrons have shaped it in recent years into a true player in world class cities.